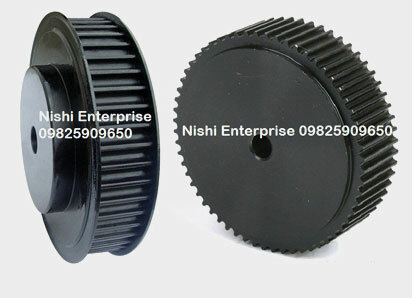 Nishi Enterprise is one of the leading manufacturers and suppliers of top grade timing pulley products in India. We offer some of the finest custom and standard models of timing pulley products that can be used for a broad range of applications. Our products offer numerous advantages over the conventional pulleys and chain drives. We not only use the best materials to create our timing pulley products but we also cover them with a coat of finish that prevents any kind of corrosion or damage in years to come. Since our products can deliver you powerful performance for a long time, you can save on your operational costs. We always provide high quality timing belt pulleys that are competitively priced for our customers. Our products come in inch (U.S.) and metric systems. When you contact us, we can provide you with a great range of sizes and styles for numerous standard and custom applications. At Nishi Enterprise, we always stock a huge selection of hard-to-find finished and plain timing pulleys made from stainless steel and bore stock aluminum materials. We can also assist you in cross referencing the part numbers that you obtain from other companies so that you can get the right pulley parts for your needs. We can provide you with the following parts. 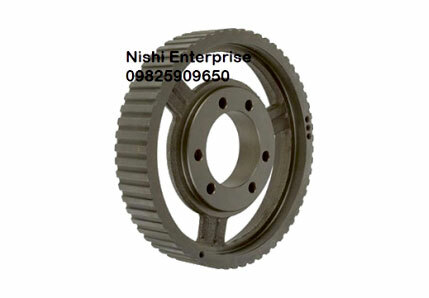 Here at Nishi Enterprise, we have been offering state of the art timing pulleys for our extensive clientele both in India and abroad for a long time. Our line of timing pulley products are compliant with international quality standards and all leading industry manufacturing standards. Here are some of the advantages of using our timing pulleys.